SAN FRANCISCO, CA – David Huerta, President of United Service Workers West, SEIU, speaks at a meeting of San Francisco janitors and other workers supporting AB 450, a bill protecting workers during immigration raids and enforcement actions. Their arrests and subsequent treatment did more than provoke outrage among Jackson’s immigrant rights activists. 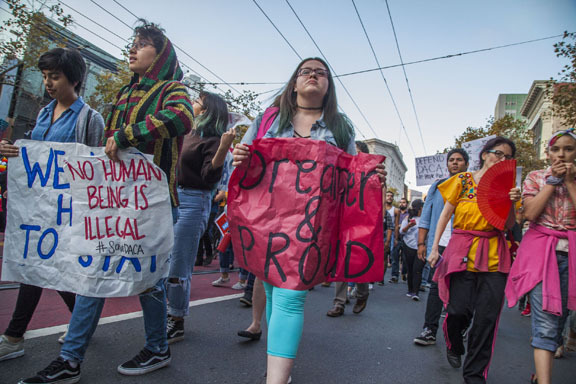 Labor advocates in California also took note of the incident, fearing that it marked the beginning of a new wave of immigrant raids and enforcement actions in workplaces. In response, California legislators have written a bill providing legal protections for workers, to keep the Mississippi experience from being duplicated in the Golden State. Donald Trump performed far better among union voters than previous Republican candidates, but since taking office has enacted disastrous anti-worker policies. Now, some unions are organizing their members around an explicitly progressive analysis, hoping to unlock the power of workers to help lead the resistance. “I did believe in him trying to get more jobs back to the United States,” says Trump voter Jack Findley of Chattanooga, Tenn. Findley worked for four years on a Volkswagen assembly line, backing the unsuccessful union drive at the plant in 2014 before an injury put him out of commission. He has two kids, ages 4 and 7, and worries as he watches power companies and retailers in his area shut down. “When my kids get old enough, I don’t know where they’re going to be working,” he says. Today was the first day of hearings. Republicans praised her and Democrats raised several important issues including her role as a leading opponent of public schools. The vote will be next week, perhaps Tuesday. Please contact your Senator today. What will Betsy DeVos’ focus on school choice mean for public education? : Education secretary nominee Betsy DeVos has neither taught nor worked in a school system, but she and her family have used wealth and influence to create more charter schools and champion vouchers. As educators watch her hearing for an understanding of her views, William Brangham talks to Frederick Hess of American Enterprise Institute and Randi Weingarten of American Federation of Teachers. The more we learn, the more we are certain that Betsy DeVos is bad for public schools and for kids. When De Vos has to choose between quality schools and “the free market,” she chooses “the free market” of privatized choice every time. The best interests of children take a back seat. And we know the DeVos endgame–shut down our neighborhood public schools, and replace them with a patchwork of charters, private schools and online learning. We can’t let that happen and we need your help. Present and future generations of children are depending on us to act now. We now know that some Senators have grave doubts. It is our job to make those doubts grow into active resistance to DeVos. Our senators are in district offices from 12/17 – 1/2. Here are our three toolkits to help you do your part. Toolkit 1. Call your senators’ offices. The toolkit with numbers and a phone script can be found here. It includes a link to phone numbers.